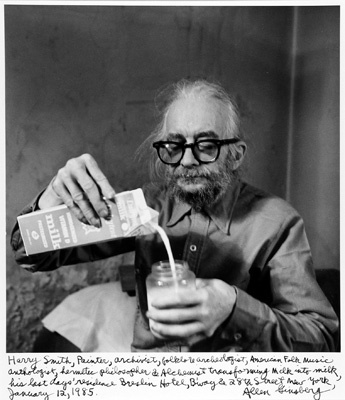 Allen Ginsberg, Harry Smith Hermetic Philosopher and Alchemist Transforming Milk into Milk NY January 12, 1985, gelatin silver print, 15 3/4 x 11 3/4". As a satellite project of “Destroy Athens,” the first biennial in that city, Tom Morton has organized “How to Endure.” The title reads not only as a reaction to the theme of the biennial but also as a commentary on the peculiar location where most of the group show takes place—a deteriorating, abandoned hotel called Serenity, located in a similarly decrepit neighborhood. The crumbling rooms, with flaking paint and the residue of filthy wallpaper, are the perfect setting for the works on view, which all have something to do with ritualistic gestures and alchemical transformations. Matthew Day Jackson turns a bright room into a postapocalyptic chapel: The colorful light filtering through the hand-painted windows diffuses a hopeful shadow across Missing Link, 2007, his menacing skeleton made of wood and metal scraps, which stands as a hybrid android or a pagan soul keeper. Other deities inhabit the rooms of this seemingly haunted hotel: Charles Avery’s sculptures portray Theodora/Dorothea and Mr. Impossible, two of the gods from the artist’s project The Islanders, 2004–, which maps the topology and cosmology of an imaginary island. Three works by Maaike Schoorel appear at first to be monochromatic paintings in different shades of white; on closer look, however, a portrait or a still life gently arises from each of the pale backgrounds—fragments of a world that seems on the verge of disappearance. In the back of the building, almost hidden, Miguel Calderón’s Los pasos del enemigo (The Steps of the Enemy), 2005, an animated video of a threatening black panther roaring at viewers, reminds us that our atavistic fears can endure centuries of evolution and await us in the darkest corners of our minds.